Flat tires are not picky. They occur on every lawn mower, trailer, automobile, bicycle and piece of equipment with wheels. Thankfully, tire sealant is an easy and inexpensive solution to your flat tire problem. But when should you use tire sealant and what tires should you use it in? And what are some examples of when you shouldn’t use tire sealant? Highway Vehicles: Slime is the go-to brand for emergency flat tire repair in your cars, trucks, SUVs, RVs and all other highway vehicles. Reach for the yellow label Emergency Flat Tire Repair sealant when your car has a flat. 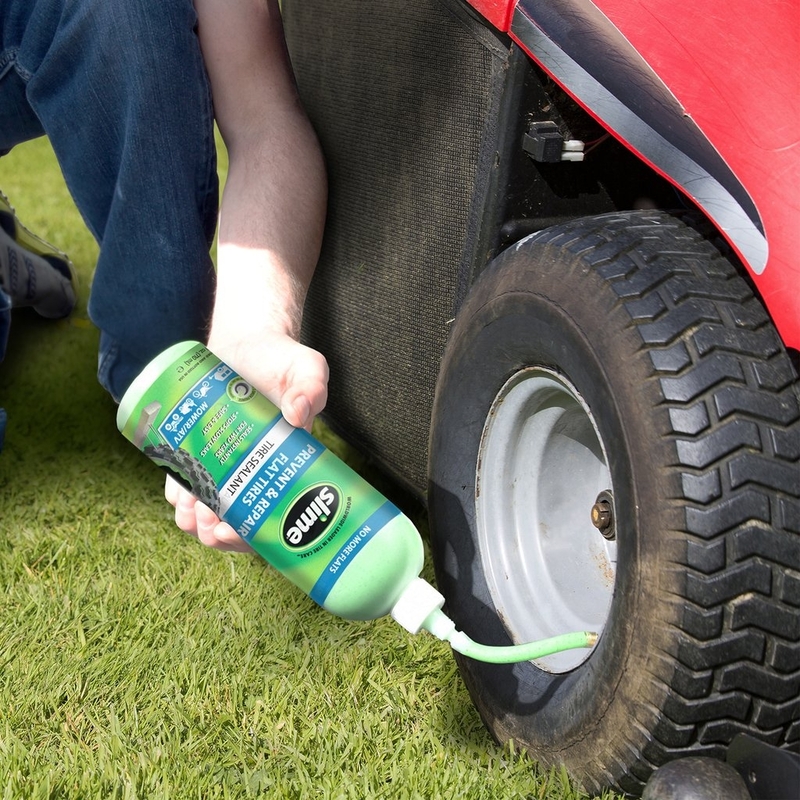 Lawn and Garden Tires: The blue label prevent and repair tire sealant bottle is a favorite for all your garden, lawn and farm flat tire needs. Slime plugs punctures and stops slow leaks for two years in your wheelbarrows, tractors, trailers, lawn mowers and much more. Tires on Powersports Toys: Don’t let a flat tire stop the fun on your dirt bike, ATV, UTV, side-by-side or other recreational vehicle. Check to see if your tires have tubes (red label bottle) or are tubeless (blue label bottle) before picking out the Slime you need. Other Tubeless Tires: The list of tires is long, but Slime repairs flat tires in all tubeless tires, including the trailer towing your boat to the lake, your golf cart, your motorcycle or scooter and much more. Bicycle Tires: Tires with tubes can also benefit from Slime. Inject the Slime red label tube sealant into your bicycle tubes and stop flats for two years. Other Small Tires with Tubes: Have a jogging stroller, wheelchair, hot dog cart, dolly or other small tire with a tube? Yep, Slime can help prevent and repair your flats for two years! Inflatables: Slime shouldn’t be used in air mattresses, river inflatables, pool inner tubes, balls, Zodiacs, etc. The Slime will simply pool at the bottom of your floatie and not seal. Keep it to tires! 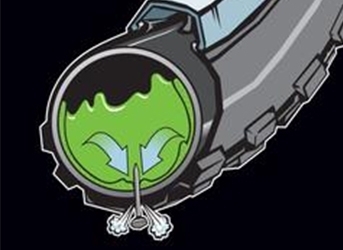 Sidewall gashes: Slime is designed to only repair punctures in the tread area of the tire. Unfortunately, tire sealants will not repair a slash on your sidewall. A bit unsure of which type of tire sealant you need? 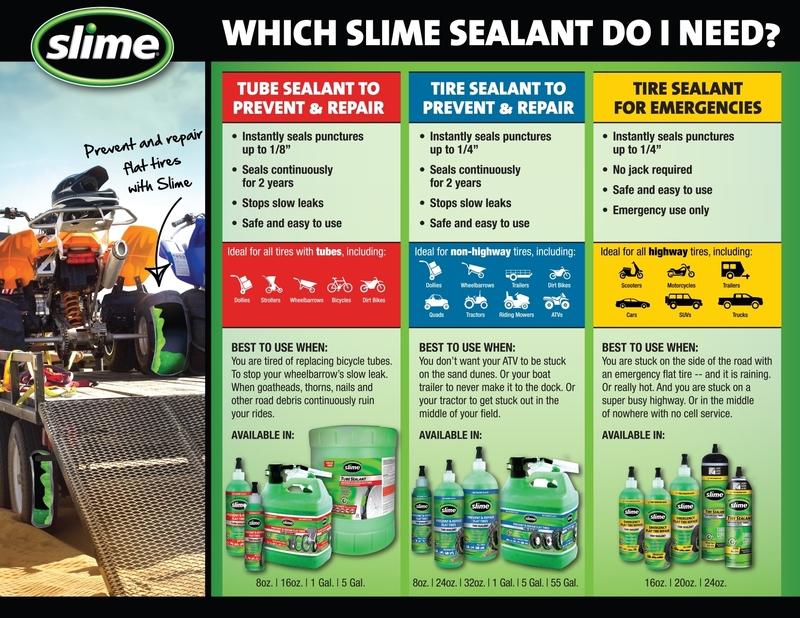 Check out this Slime Tire Sealant Comparison Chart or look at the vehicle icons on the front of the bottle to pick the perfect Slime for your tires!